Pel isn’t like your average Ferengi. He’s loyal, smart, trustworthy, and has a serious crush on Quark. Pel also happens to be a female posing as a male since Ferengi only allow males to do things like business, reading, and wearing clothes. 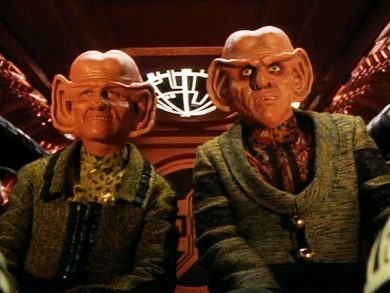 Will Quark return from the Gamma Quadrant with a huge profit and a boyfriend who’s a girlfriend? Rules of Acquisition go into this week’s Mission Log.